Carbon dioxide emitted into the atmosphere by human activities influences the amount of the sun’s energy trapped by Earth’s atmosphere. These emissions are the subject of a United Nations climate conference in Paris later this month. To improve the information available to policymakers on this issue, scientists are grappling with the complex question of whether Earth’s oceans, forests and land ecosystems will maintain their capacity to absorb about half of all human-produced carbon dioxide emissions in the future. Atmospheric carbon dioxide levels recently surpassed a concentration of 400 parts per million (ppm) — higher than at any time in at least 400,000 years — and continue to increase at about 2 ppm per year. Levels of the even more potent heat-trapping gas methane — also carbon-based — now exceed pre-industrial amounts by about 2.5 times. Calculations show that, on average, only about half of the carbon emitted by human activities remains in the atmosphere. This “other half” of the carbon problem — how and where it is absorbed on land and sea — is a priority for carbon cycle scientists at NASA and around the world. Scientists are investigating how Earth’s warming environment will affect the ability of ecosystems around the world to absorb carbon naturally, and what changes in those ecosystems could mean for future climate. It’s a major research question involving several NASA satellite missions, multi-year field campaigns and new instruments that will fly on the International Space Station in coming years. Scientists discussed the ongoing analysis of the first year-plus of satellite data from NASA’s recently launched Orbiting Carbon Observatory-2 — the agency’s first satellite designed to measure carbon dioxide from the top of Earth’s atmosphere to its surface. OCO-2 already is demonstrating the accuracy, precision and coverage needed to provide the first complete picture of both human and natural sources of carbon dioxide and the places where they are being absorbed. 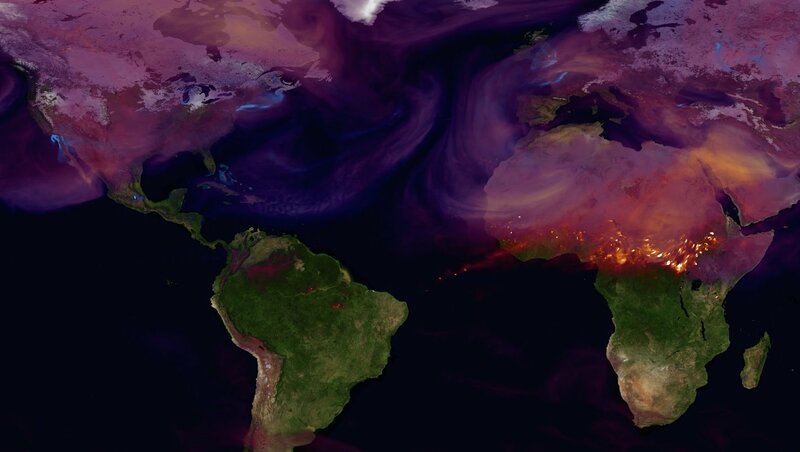 While the mission gives scientists new, near-global data on atmospheric carbon dioxide, satellite data cannot directly observe the processes by which the gas is absorbed on the land and ocean. To better understand these processes, NASA scientists will use satellite data and detailed field experiments in concert with super-high-resolution computer models. Scientists need this integrated approach in order to continue to more accurately predict how carbon-absorbing ecosystems will respond to a warming climate. Also causing concern is the potential for the ocean’s rate of carbon absorption to change as ocean temperatures rise and phytoplankton communities show signs of change. NASA’s North Atlantic Aerosols and Marine Ecosystems Study (NAAMES) launched ship and airborne studies last week to the North Atlantic Ocean, where satellites have documented surprising phytoplankton behavior in recent years. Forest and other land ecosystems are also changing in response to a warmer world. Some ecosystems — such as thawing permafrost in the Arctic and fire-prone forests — could begin emitting more carbon than they currently absorb. Next fall, NASA’s Arctic Boreal Vulnerability Experiment will begin a 10-year investigation into the fate of carbon stores in rapidly warming regions of Alaska and Canada. Two instruments that will fly on the International Space Station in coming years — Global Ecosystem Dynamics Investigation and ECOsystem Spaceborne Thermal Radiometer Experiment on Space Station, which will provide crucial observations of plants and forests.